About 0.4% volatile oil (compolsed of menthol, mentone and mehtylacetate with smaller amonts of menthofuran, limonene, pulegone, cineole, bisabolene, isomenthol, neomenthol, flavonoids, phytol, tocopherols, carotenoids, betaine, choline, azulenes, rosmarinic acid, tannin. Peppermint oil is toxic if ingested in large doses. It may cause drowziness and violent vomiting. Cases of severe poisoning are rare. Pure menthol when used in the form of an inhalant for infants may cause asphyxiation. Preparations using 2% menthol when used as nasal drops are hazardous and may cause respiratory paralysis in infants. Excessive ingestion of peppermint lollies have been reported to cause arrythmia of the heart. Normal heart rate is restored when ingestion of the lollies ceases. 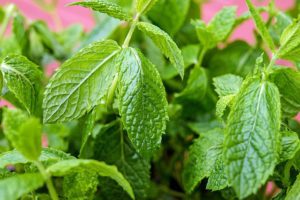 Both peppermint oil and menthol even in low doses can cause mild allergic reactions such as rash and headaches in sensitive individuals.